Biotechnology has made its way to “the happiest place on earth,” with an exhibit at Walt Disney World’s EPCOT (Experimental Prototype Community of Tomorrow) theme park now featuring genetically-modified (GM) fruits and vegetables, some of which are shaped like Mickey Mouse’s head. With over 2.5 million square feet of greenhouse space,Living with the Landis a behemoth display of agricultural technology, including a giant gravity-defying tomato “tree” with thousands of tomato fruits, and various displays of unique growing techniques like hydroponics. But according to Jill Fehrenbacher fromInhabitat, a tour guide explained to her that most of the food grown in these greenhouses, which is also fed to park guests in restaurants and cafeterias throughout the parks, has been genetically-altered in some way. This makes sense, since part of the tour includes a visit to the exhibit’s “Biotechnology Lab,” a “sterile research environment” sponsored by pro-GMO food giant Nestle USA, where scientists from theU.S. Department of Agriculturecan be seen working on various “crop improvement” techniques. After the tour, park guests can even purchase “Mickey’s Mini Gardens,” which are small glass bottles of plant starters made from cloned plant cells rather than from natural seeds, that were produced in Biotechnology Lab. Genetic manipulation of plants and crops has apparently been taking place at Disney’sLiving with the Landexhibit for almost two decades now. 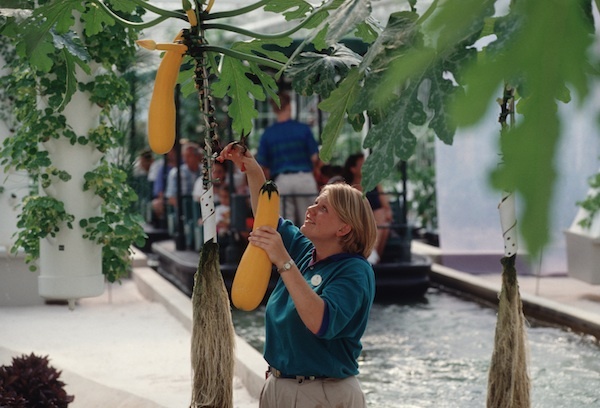 Back in 1996, the USDA published an article in one of its publications explaining that the main purpose of the Biotechnology Lab at EPCOT has always been about “showcasing various tools — such as biotechnology” as part of its “sustainable agriculture” initiatives. Even back then, John Cordts from the USDA’sAgricultural Research Service(ARS) admitted that he and others were working on various GMO projects in the lab, which at the time included exploring new ways to genetically-alter peaches to ripen longer on trees, yet stay firm enough to be shipped. And before that, then-manager of the Biotechnology Lab Lexie McKently had been working on developing GM peanuts (http://www.ars.usda.gov/is/ar/archive/jul96/disney0796.htm). And yet the millions of young children that have passed through this exhibit over the years have no idea that what those scientists are working on behind the glass has been shown to cause human sterilization, organ damage, and death. Because the entire presentation is dressed up with cute Disney characters and fun animations, it all just looks like some type of agricultural utopia. Interestingly, the veneer of Disney’s supposed sustainable and pollution-less approach to agricultural runs thin in others areas as well, as Fehrenbacher’s tour revealed the use of materials like non-biodegradable styrofoam to house plants, for instance. When asked by several guests why the exhibit featured styrofoam and other environmentally-unfriendly materials, the tour guide allegedly explained that these materials are inexpensive and easily disposable. So as is the case with most things Disney, theLiving with the Landexhibit appears to be nothing more than a thinly-veiled veneer of propaganda aimed directly at young children. And in this case, the Disney empire has “greenwashed” biotechnology as an environmentally-friendly and sustainable agricultural system of the future in order to convince the next generation that it provides great benefits to humanity. It is no secret that millions of families from around the world make the trek to Orlando, Fla., every year to visit Walt Disney World theme parks specifically because they believe it is a safe and fun environment for children. Little do many of them know, however, that part of Disney’s apparent agenda is to indoctrinate society’s youngest and most innocent members into the phony dogma of biotechnology. Deliberately shaping a genetically-modified pumpkin into the shape of Mickey Mouse ears, for example, would probably not sway mostNaturalNewsreaders into thinking that the technology is safe. But to a child, this explicit form of manipulation appears fun and exciting, which subconsciously instills in him or her the idea that genetically-tampering with nature in this way is a good thing. Because they cannot present a legitimate and scientific argument for why GMOs are safe or necessary in the first place, purveyors of biotechnology are now resorting to such blatant brainwashing campaigns aimed directly at young children. This is why parents everywhere need to take the time to explain to their children the truth about GMOs, and teach them how to deflect all the crafty propaganda that is increasingly being embedded in popular cultural icons like Disney.